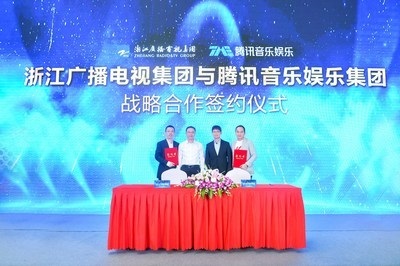 Entries from Digital Intelligence tagged with "tencent"
Tencent Music Entertainment Group (TME) and Zhejiang Radio & TV Group (ZRTG) have agreed to strengthen their three-year strategic partnership, deepening their commitment to upgrading the content and distribution channels of both platforms, breaking the collaborative model between TV network and internet enterprise. Chinese web giant Tencent and the UK Department for International Trade (DIT) of the United Kingdom (UK) have partnered to launch various “Culture Creative” initiatives. By 2025, 80% of all digital services to be delivered through a few core platforms, according to a new forecast. 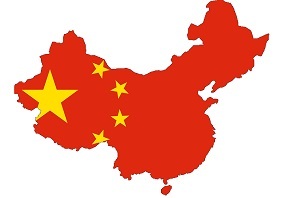 Brands are pursuing the ‘Chinese Dream’, growing total brand value by a record 23% to $683.9 billion in the WPP 2018 BrandZ™ Top 100 Most Valuable Chinese Brands ranking. Music giants Spotify and Tencent Music are buying minority stakes in each other ahead of the Swedish firm's expected stock market listing next year. Chinese internet giant Tencent hosted "China Day" at Cannes Lions and won its first Gold Lions Award, the Cyber Lions, for its QQ Alert. China’s urban middle class have moved from price to premium in the 2017 BrandZ Top 100 Most Valuable Chinese Brands. Unilever has struck a deal with JD Worldwide, a cross-border e-commerce platform linked with Chinese web giant Tencent, as the FMCG conglomerate looks to expand its online presence in the Asia Pacific region. Tencent has reached $200 billion market capitalisation in Hong Kong-based trading last night, meaning that the Chinese social networking firm has overtaken Amazon in size. Chinese entertainment firm Dalian Wanda (owner of the AMC cinema chain) is reportedly set to make a massive move into ecommerce via a partnership with Tencent and Baidu. Tencent has announced that its mobile messaging app WeChat ended the first quarter of 2014 with 396 million monthly active users, as its expansion beyond China continues. Chat app WhatsApp is now attracting more than 250 million active monthly users, making it one of the largest communications platforms in the world, according to a news report. Internet analyst Mary Meeker’s slideshow presentations on global internet trends have become something of a major industry event, with this year’s data showing huge mobile growth. Social media continued its rise in 2012, pervading more and more aspects of modern life, from Twitter’s live news reporting to Pinterest’s digital scrapbooks. 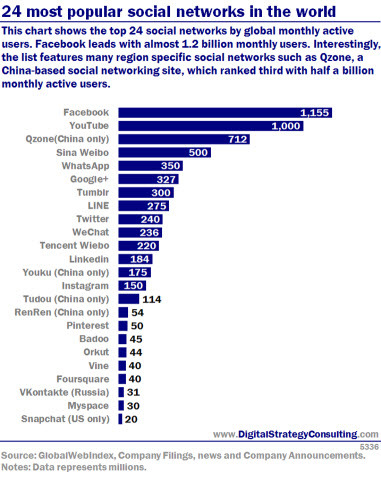 Despite being labelled a ‘ghost town’, Google+ has become a major player in the sector, beginning to rival Twitter in terms of global active users. For marketers, social media ROI remains rather elusive, but some inroads have been made this year with new analytics tools looking beyond clicks to measure the power of online recommendations. As part of a 2012 review, we look back at the 10 most popular social media news stories and trends of the year. China's e-commerce sector grew a massive 45% year-on-year in the second quarter, accounting for 12.5% of the country's GDP, according to new research. The study, from Analysys International indicates that total sales in China was 278.84 billion yuan ($44.5bn/ £36bn), with Alibaba Group's Taobao capturing a huge 76% of the market. Zynga is to create a Chinese version of its CityVille game, despite its platform of choice, Facebook, being blocked in the territory. The game will be played via internet portal Tencent instead of Facebook, where most of its games are played, but which is blocked in China. Zynga recently filed for a much anticipated IPO but has been criticized for being too dependent on Facebook, its primary distribution platform, which accounts for the overwhelming majority of the company’s users and revenues.